Lately, I’ve been focusing on reducing my food costs and cooking good, interesting food without spending too much. I have started buying a lot more canned food and dry goods, which is basically the opposite of the farm-fresh movement that everyone loves right now. But, it’s not as bad as it sounds. You can get plenty of frozen and canned vegetables that have no additives and taste completely fine. In fact, Mark Bittman at the New York Times has been a big proponent of healthy canned food and the like for a long time – it’s more important to eat vegetables, any vegetables, than to focus on vegetable terroir. I have also been fascinated by news about a cookbook called Good and Cheap, a project by grad student Leanne Brown. The cookbook is free to download, all the recipes only cost a few dollars to make, and the food is actually good. I’d love to make some of these recipes, and honestly, I wish I had thought of the idea myself. In that spirit, I made a pretty great Frankenstein of a meal the other week with quinoa, a can of corn and a can of black beans. All I had to do was add some spices, soy and Sriracha, and I had a nice little grain bowl with no particular ethnic origin for less than $5. It fed me for two meals in addition to providing the quinoa for this dish. Which brings us to the actual recipe that this blog post is about. In my quest for smaller grocery store bills, I bought a couple of boxes of Pomi tomatoes off of the clearance rack at Publix weeks ago. Pomi tomatoes are awesome – they literally have one ingredient listed on their packaging, and it is tomato. I keep trying to challenge myself to cook with things already in my pantry, and I knew I had these, but I just was not feeling Italian food, the most obvious tomato-heavy cuisine. After browsing recipes for dozens of minutes – DOZENS! – I finally ran across an Indian-themed tomato sauce with curry and coconut, a flavor combination to which I am currently addicted. So, I got my tomato sauce! Now I had to figure out what I was going to slather in it. In a perfect world, I would have picked a whole leg of lamb and roasted that, but that’s obviously not an economical choice for a weeknight dinner for one. I decided instead to go with some chicken leg quarters, because they are cheap but also because I thought a big old broiled chicken quarter would look more dramatic on a plate and take cool pictures. Unfortunately, this was not the case and I think that this blog post features some of my worst photography in some time. I only broiled one of my chicken pieces, so I only had one option for photos, and I just didn’t really get the colors I was expecting (char on the chicken, herbs in the sauce, etc.). But, I would still encourage people to make this dish because it’s interesting, hearty, healthy and cheap. Which is the whole point anyway. In a large skillet, probably the largest one you have, melt butter over medium heat. When the foam subsides, add the onion and chopped pepper with a pinch of salt and cook until softened, about five minutes. Add garlic and ginger, cooking for a minute or two, until very fragrant. 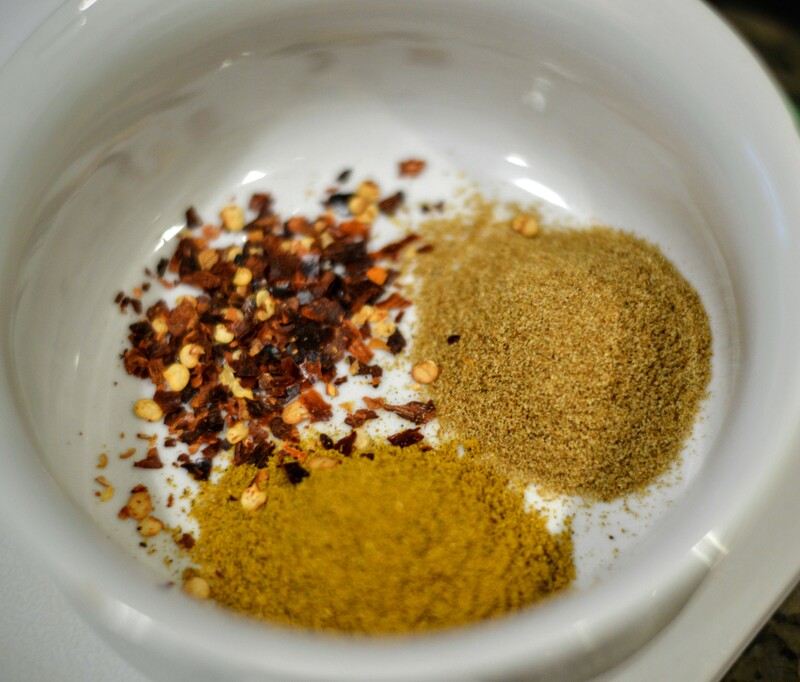 Add curry powder, pepper flakes and cumin, another pinch of salt and some black pepper all at once. Stir to incorporate spices into the mixture; the butter will look almost like spice-colored paste. Let cook for two minutes. Add tomatoes to the pan and stir well to incorporate the spices and aromatics into them. Bring to a boil, then reduce heat to low and let the mixture simmer for 15-20 minutes. At the same time you add the tomatoes to the pan on the stove, set your oven’s broiler to high. Put a cast iron skillet or other heavy, medium-sized baking dish into the oven about 6 inches from the heating element to heat up. Sprinkle chicken with salt and pepper, then drizzle it with olive oil. When the dish in the oven is hot, almost smoking, take it out and add the chicken to it, skin-side down, then put it back in the oven. Flip chicken every 5 minutes for 15-20 minutes until an instant read thermometer inserted into the thickest part of the thigh meat reads 165 degrees. Remove chicken from oven. While your chicken cools to edible temperatures, add coconut cream and cilantro to the tomato sauce on the stove. Stir well to incorporate and cook for another 5 or so minutes. 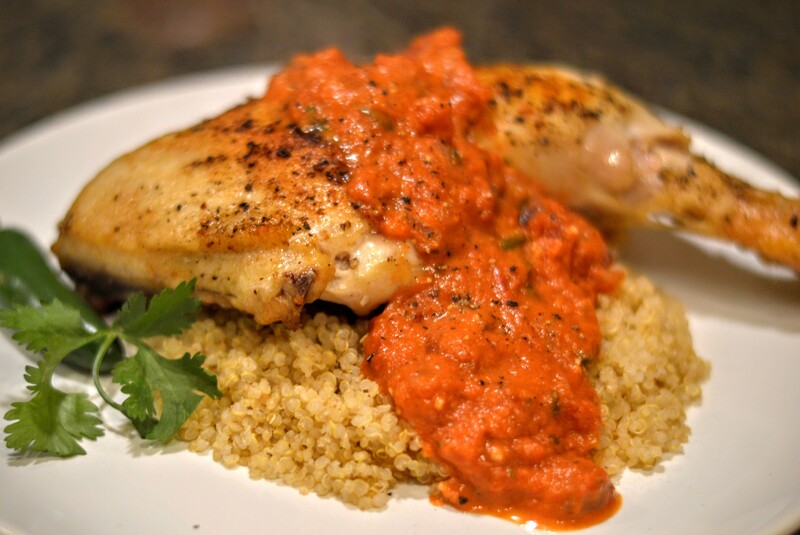 Serve chicken and sauce over quinoa or rice or with a side of mashed potatoes. Looks amazing! For another great resource for food on a budget, this is a site I’ve used in the past: http://www.budgetbytes.com/. You probably have already heard of it, but just in case. Great post as always!